I have very fond memories of stuffing my face with puppy chow as a child. 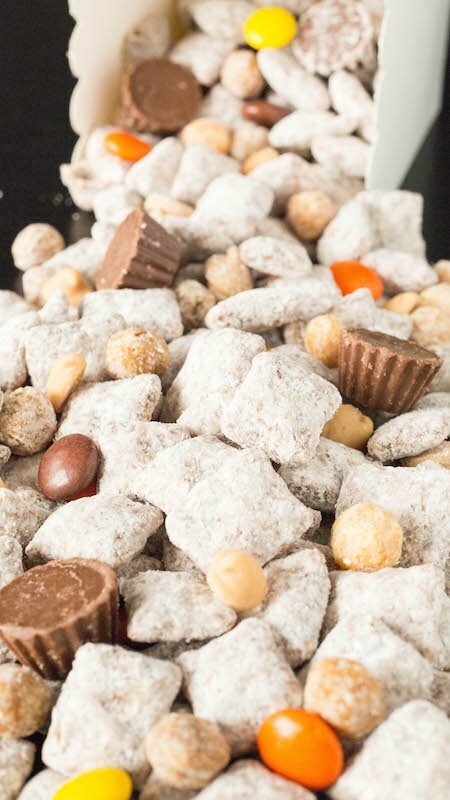 What kid doesn’t love crispy cereal covered in chocolate, peanut butter and heaps of powdered sugar?? 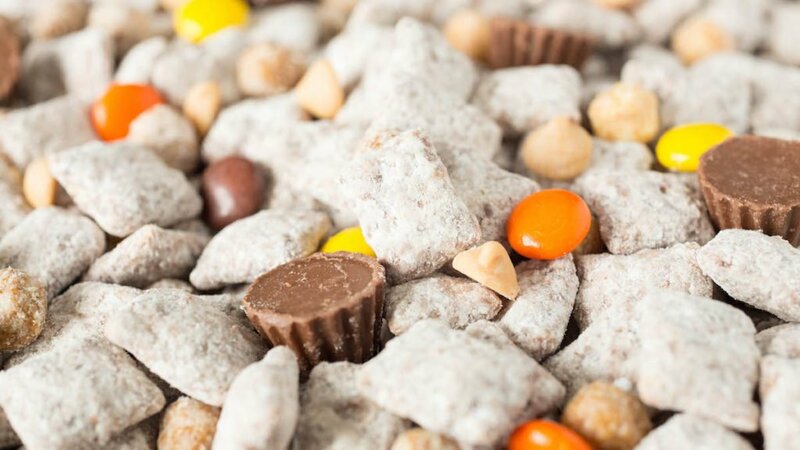 We grew up eating just plain ol’ puppy chow but these days kids are spoiled with a plethora of options. 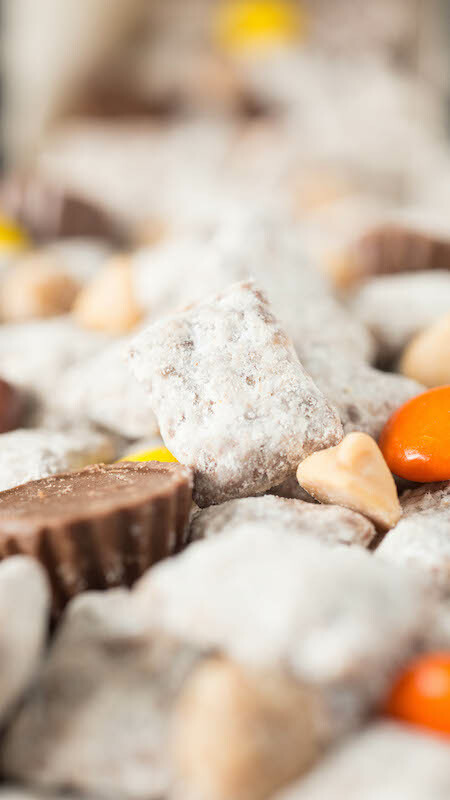 Just a quick search on Pinterest for puppy chow will bring up numerous variations. Everything from birthday cake to sugar cookie and even s’mores! It got me thinking…what would be my dream puppy chow recipe? Reese’s always seems to be on my mind during the month of October. I just made a Reese’s Cereal Milk White Russian for my friends at Drizly. It was so incredible and made me fall in love with Reese’s all over again. Staring at the leftover ingredients convinced me that I should incorporate them into my puppy chow and make all my chocolate and peanut butter dreams come true. I think the only way you could possibly make it more Reese-tastic is to use Reese’s Peanut Butter spread instead of traditional PB. I seriously can’t wait to munch on handfuls of this puppy chow while watching Halloween movies. It’s going to be a fantastic October! Place the Chex Mix into a very large bowl. Put the semi-sweet chocolate chips, peanut butter, and butter into a microwave-safe bowl. Microwave in 30-second intervals, stirring after each one until chocolate is smooth. Pour the chocolate peanut butter over your Chex and gently stir until all of the pieces are nicely coated. Now it’s time to add the powdered sugar. I like to sift mine so that it doesn’t have any clumps, but if you don’t want to go to the trouble, just dump it in. Mix until all of the Chex cereal pieces are nicely coated. If you need to add a little more powdered sugar, go right ahead. Thanx for the recipe!!! Just curious, how do you pronounce your name? My oldest daughter’s name is Janissa. You’re welcome! This blog is run by two people JANette and me, JessICA. So we pronounce is like those two names smashed together “Jan-eh-kuh”.